Leave it to the “Best User Interface 2009” App Awards winners to make THE ToDo List you’ve been waiting for: Zero complications. Zero frustration. Just a stunning to do list you can finally understand and use. With the help of the free Sync helper, you can effortlessly keep your Mac/PC and the 2Do app in sync. 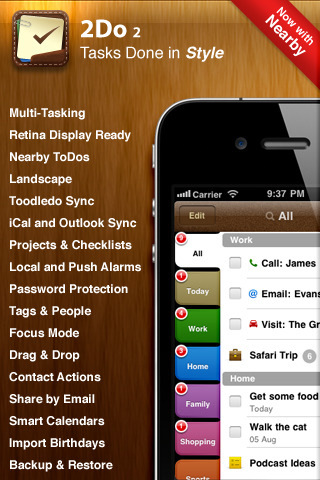 You can also instead sync with Toodledo anytime, anywhere. NOTE: Event items are currently not synced from the Mac/PC, only To Do / Tasks are. Mac Sync requires 10.5+. Also, “Mobile Me Calendar” (currently beta) NOT supported. All versions of Outlook (32/64-bit) supported. Away from your PC? Not a problem. Enjoy the free alerts by 2Do. Choose message, sound, email or all three to remind you of what needs to get done. Go landscape to see even more. Tag tasks with locations and let 2Do filter on nearby tasks effortlessly. Get more done whever you are. Attach a Contact to your ToDo to remind you of calling, emailing, visiting them etc, or attach your current location to the ToDo you’re creating for future reference. Star tasks that need immediate attention and view them separately in the built-int ‘Starred’ special tab. Supports Toodledo syncing as well. Too lazy to type? Attach voice notes to your tasks. Batch edit, delete, move, tag or share tasks all from a single place. Protect your tasks and calendars from prying eyes by locking them. Save searches as Smart Calendars. Great way to filter your Contexts and selected phrases. Backup and restore the 2Do any time. Auto backups created before each sync for your peace of mind. Tap and hold on a task to reveal more options. Send tasks to friends and family via email.